Deadite Alert! Ash vs. Evil Dead Hits New York Comic Con 2015! Get your boomsticks out and start practicing your Klaatu Barada *cough* incantations! Starz is bringing Ash vs. Evil Dead to New York Comic Con 2015! The series – which premieres on Halloween – will host a panel in Hammerstein Ballroom and autograph signings in Ash’s trailer at the Inner Roadway. Follow the jump for further details. 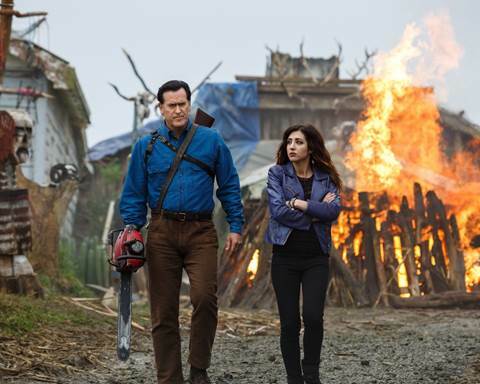 WHAT: STARZ brings its hotly anticipated Original series “Ash vs Evil Dead” to New York Comic-Con 2015. The series premiering Saturday, October 31st at 9 PM ET/PT will host a panel in Hammerstein Ballroom as well as autograph signings and press interview opportunities. The panel will include Executive Producers and original filmmakers Sam Raimi, Bruce Campbell, showrunner Craig DiGregorio, plus cast members in addition to Campbell including Lucy Lawless, Ray Santiago, and Dana DeLorenzo. Previous PostGreen Trailer: The Jungle Book!Next PostEPIX Offers Offline Viewing!